Geotripper: The Hawai'i That Was: Walking a Lake of Fire in "the Little Source of Great Spewing"
The Hawai'i That Was: Walking a Lake of Fire in "the Little Source of Great Spewing"
Kilauea is one of the five major shield volcanoes making up the Big Island of Hawai'i. As we found in the last post in this series on the "Hawai'i That Was", Kilauea is the most active of the island's volcanic centers, with an ongoing eruption dating back to 1983. On our first full day on the island, we had a look at the smoking pit of Halemaumau, but in the afternoon, we headed over to Kilauea Iki ("little source of great spewing"). Kilauea Iki from the northeast rim. Pu'u Pua'i is the mound on the right. The steam and gas in the distance is the ongoing eruption of Halemaumau. This picture is from 2009; it was foggy at this point on our recent trip. 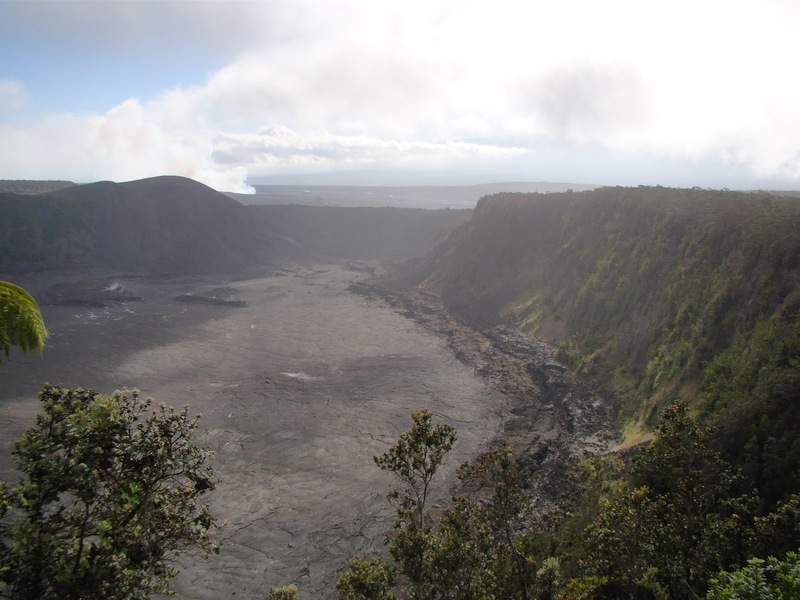 Prior to the 15th century, Kilauea Iki was not a crater at all, but was instead a small shield volcano called 'Aila'au. It collapsed in the aftermath of an eruption, forming a pit crater 800 feet deep (the present crater is only half that depth). One of the lava tubes formed in the eruption is today known as Nahuku (Thurston Lava Tube). It is lit, and is an easy walk from Crater Rim Road (good luck finding a parking spot on busy days). Our goal for the day was to hike the north rim of the crater, descend into west end of the crater itself, and then climb the east rim, a distance of about 3 1/2 miles. If that looks like an abrupt dropoff to the left, it is; it's a sheer 400 foot cliff into the crater. The trail begins in a phenomenal high altitude rain forest (4,000 feet, ~100"/year) composed mostly of native Ohi'a trees and ferns. On my last trip in 2009, the forest was filled with kahili ginger, an aggressive invasive species. It has pretty flowers, but forms thickets that crowd out the natives. I didn't see any at all this time, although I am sure they are lurking in the forest away from the trail (kudos to the trail crews removing them). Another serious pair of problems in the native rainforests were the feral pigs and goats. The pigs arrived with the Polynesians over 1,000 years ago. The goats arrived with Captain Cook and his crew, the first Europeans to discover the islands in 1778. Both animals wreaked havoc on the forest. The animals were finally removed by the 1990s, so the forests at Hawai'i Volcanoes are approaching something resembling their original state. The day had been overcast, but as we passed in opening in the forest we could see across the crater to Pu'u Pua'i, a mountain that is younger than I am. The extraordinary eruption that produced this landscape began in November of 1959 as lava started pouring from a rift system on the south side of the Kilauea Iki crater. The eruptions consolidated into a single vent within a few days, and for the next five weeks, spectacular things happened. Seventeen different times, lava shot high into the air, and the crater filled with millions of cubic yards of simmering basalt. At the end of an eruptive episode, some of the basalt would drain back into the vent, but as the weeks passed by, Kilauea Iki crater filled to a depth of 400 feet (recall the original crater was 800 feet deep). During the latest stages of the eruption, the lava fountain reached a height of 1,900 feet (580 meters), the highest ever recorded in Hawai'i. 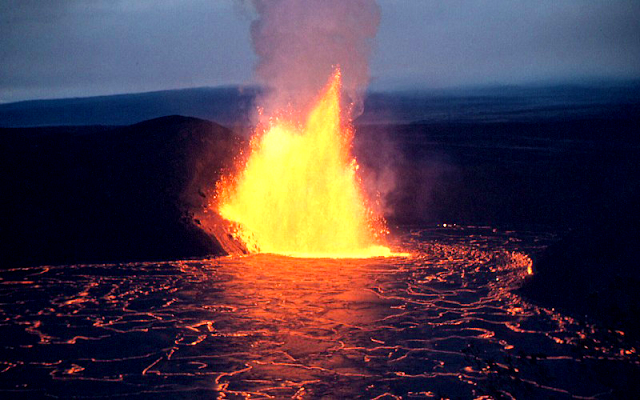 In the aftermath of the eruption there was a brand new cinder cone, and a lake of molten lava. During the final draining event, the lake level dropped about fifty feet leaving behind a "bathtub ring" (sciency version: "lava subsidence terrace"). We descended out of the forest, over the bouldery terrace, and into a ghostly barren landscape. After a few minutes we passed the remains of the eruptive vent at the base of Pu'u Pau'i (below). From then on, we were walking on a lake of fire. The eruption may have ended in 1959, but a four hundred foot deep lake does not cool all at once. It doesn't take weeks, or even months. It takes decades. Four months after the eruption, the crust was only 9 feet thick! Drilling allowed researchers to track the cooling process. In 1967, the crust was 90 feet thick, and in 1975 it was up to 180 feet (See Hazlett's book for details). The lava lake was more or less solid by the late 1990s, but there is no doubt that it is still very hot down below. Whenever the rain starts (roughly every five minutes, it sometimes seems), steam can be seen rising from fractures in the lake surface (below). Steam rising up the old drill holes is hot enough to scald. We continued across the surprisingly flat surface of the lava lake. There were pressure ridges and fractures here and there, but the trail was easy to follow, using ahu (cairns, or rock piles). One of the most astounding things about this lake of fire is the stubbornness with which life seeks to take root. 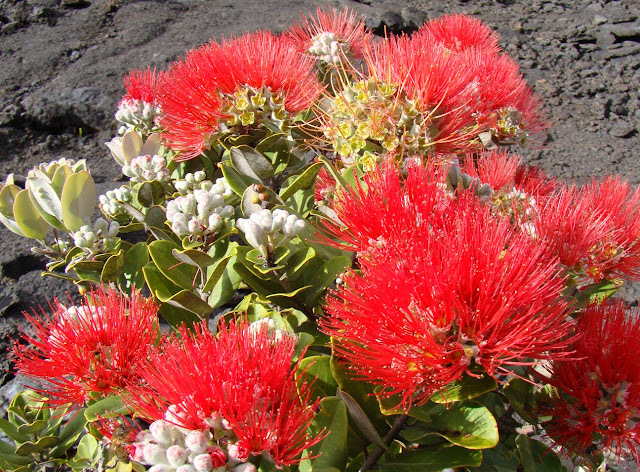 Native Ohi'as are one of the most adaptable trees on the planet. They can form hundred foot high canopies in the native rainforests, but they can also grow in one of the most ghastly environments possible, that of a fresh lava flow. We passed dozens of scraggly bush sized Ohi'as and hundreds of small ferns. Recall that the forest on the rim above is no older than 500 years. In a few centuries (barring new eruptions, which are likely), this barren surface will be a thick forest. 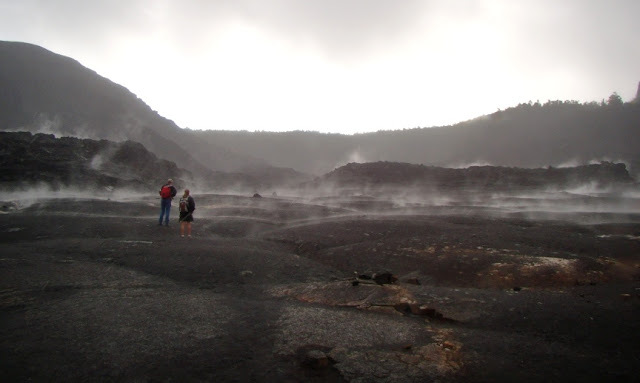 We reached the eastern edge of the crater just as the rain began to pour. The change back to rainforest was abrupt. We climbed four hundred feet up a relatively gentle gradient and found our way to the vehicles. We had crossed the lake of fire and survived! 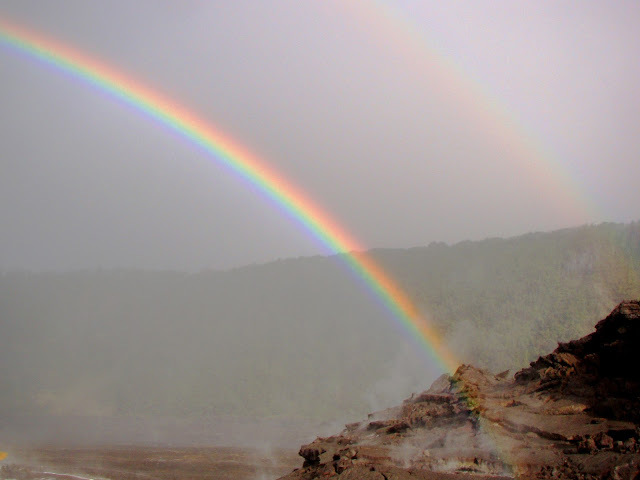 We never really saw the sun on the day's journey, but when we visited in 2009, we were treated to a gorgeous rainbow as we set off across the crater floor. It was astounding. If you ever have the chance to visit Hawai'i Volcanoes National Park and want to see a bit of the native environment of the islands (the Hawai'i that was...), this trail is one of your best chances to see what it was like.